To date, there has been a good degree of distance between the goings on in the film world of the Marvel Cinematic Universe and the television world. For example, we have not yet seen a character from any of the Marvel shows – either on ABC or Netflix – show up in one of the movies. Well, the good news is that relationship may soon grow closer, as it looks like a key character from the upcoming Luke Cage series will be making her MCU debut in Joe and Anthony Russo’s Captain America: Civil War - specifically Alfre Woodard’s Mariah Dillard. Walt Disney Studios has sent out the tip sheet for the blockbuster’s world premiere in Los Angeles next week, and while most of the names in the "From The Film" section are people you would expect – including Chris Evans, Robert Downey Jr., Anthony Mackie, Sebastian Stan, Chadwick Boseman – but one interesting name included is Alfre Woodard. This wouldn’t normally be a big deal, given that casting of small roles sometimes flies under the radar, but what’s significant is that Woodard has been spending recent months in production on Luke Cage, starring as the aforementioned powerful politician in Harlem, New York. We contacted Disney for a statement about Alfre Woodard’s role in the movie, but they would neither confirm nor deny the identity of her role in Captain America: Civil War. If this is all true, technically Mariah Dillard wouldn’t be the first Marvel TV character to appear in a Marvel movie, as the blockbuster would actually be her real debut in the Marvel Cinematic Universe – meaning that she would enjoy the list of film-to-television characters that includes Samuel L. Jackson’s Nick Fury, Jaimie Alexander’s Sif, Hayley Atwell’s Peggy Carter, and Dominic Cooper’s Howard Stark. Still, the idea of the relationship between the big screen and small screen worlds starting to get closer is extremely exciting, given that we would really love to see Daredevil, Luke Cage, Jessica Jones and Iron Fist hanging out with the Avengers someday. 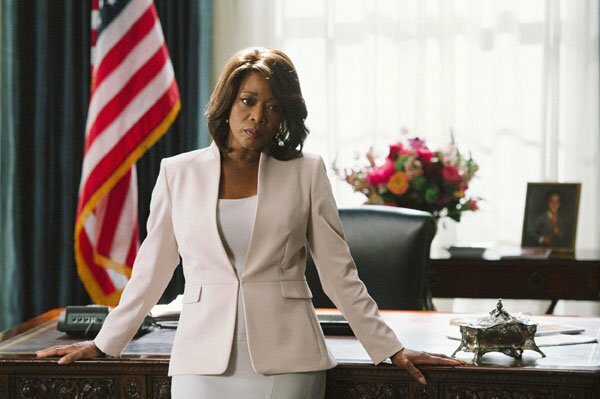 Of course, it’s important to mention that it’s very possible that Alfre Woodard isn’t actually playing Mariah Dillard in Captain America: Civil War, as there are a handful of actors who have played more than one part in the MCU (such as Laura Haddock and Matt Gerald). Still, we’re going to hope that this is a strong instance for the larger continuity of the cinematic universe and hope that Woodard is playing the same role in both Luke Cage and Captain America: Civil War. We don’t have long to wait for the answer to this question, as Captain America: Civil War will be in theaters on May 7th.